Highlighting some of my favorite local food-and-beer pairings. The classic burger, topped with cheddar cheese and bourbon-garlic caramelized onions, is among the many menu items at Squatters. In ever-increasing numbers, craft beer aficionados are following a trail initially broken by their wine-loving brethren: Oenophiles know that wine is almost always better and more interesting when paired with food. Over the past couple years, I've seen more and more food-and-beer pairing dinners advertised, as well as more articles and blogs devoted to pairing beer with food (see current cover package for more). With the upcoming Utah Beer Festival in mind, here are a handful of my recommended marriages of pub grub and suds from some of our great local breweries. There are few brews I enjoy more than Latter Day Stout on the nitro tap at Desert Edge Pub & Brewery (551 S. 600 East, Trolley Square, SLC, 801-521-8917, desertedgebrewery.com). The beer is a classic Irish stout with chocolate malts, roasted barley and nugget hops. Maybe you don't typically think of drinking beer with dessert, but you should. The chocolatey goodness of Latter Day Stout, along with its coffee-like flavors, is a slam-dunk when sipped alongside Desert Edge's rich, flourless Chocolate Decadence. At Red Rock Brewery (multiple locations, redrockbrewing.com), I've developed quite a fondness for their Juice Almighty. It's what the Red Rock brewers call a New England IPA—a hoppy, bitter (in the best way), hazy brew with herbal notes. The crisp acidity of an IPA makes it a good partner for spicy dishes such as Red Rock's seafood linguini puttanesca, which incorporates tangy green olives, capers and chili flakes. I'd also try Juice Almighty with the sriracha-spiked chili-glazed-shrimp salad. Greg Schirf's Wasatch Brew Pub (250 Main, Park City, 435-649-0900; 2110 S. Highland Drive, SLC, 801-783-1127, wasatchbeers.com) was Utah's first, and is still one of the best. For the past few years, my go-to Wasatch brew has been their Jalapeño Cream Ale. Imagine enjoying a Hudepohl-Schoenling Little Kings Cream Ale subtly infused with jalapeño. It's a refreshing and tantalizing summertime sipper that pairs especially well their loaded mac-and-cheese, which is also barbed with the chiles. The creaminess of the cheese cuts through the beer's hot-pepper heat like a warm knife through butter. In Proper Brewing Co.'s (857 S. Main, SLC, 801-953-1707, properbrewingco.com) LeisureBrau India Vienna Lager, slightly sweet Munich and Vienna malts contrast with American IPA-style hoppiness to create a very provocative, cold-lagered hybrid brew. 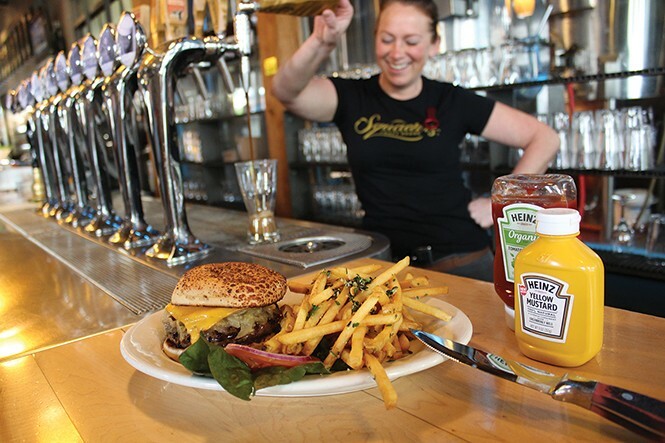 It's a versatile beer that would pair with a range of foods, but I particularly like the idea of sipping it next to Proper's Johnny Utah burger, with American cheese, house-smoked pastrami, Russian dressing, coleslaw and zucchini pickles. The rarebit fries are also a good match: large-cut fries with beer-and-cheese rarebit sauce, red onion, tomato and bacon. Whenever I visit Squatters (multiple locations, squatters.com), the expertly crafted Vienna Marzen Lager inevitably calls out to me. Sweet caramel malts characterize this luscious, lightly hopped beer, which sort of screams for schnitzel and spaetzle. Since those Austrian standbys aren't on the menu, I opt for a different type of pork dish to pair with it: carnitas. The Mexican-style carnitas at Squatters are made with high-quality, slow-roasted Niman Ranch pork and served with warm corn tortillas, queso fresco, fresh cilantro, salsa, guacamole, refried beans, rice and pico de gallo. This pairing presents a delicious example of Old World meets New. If you're not quite up for that much food, the Marzen is also the perfect foil for Squatters' pub pretzel with three-cheese sauce and Full Suspension Pale Ale mustard. Now that you're salivating: Got your Beer Fest tickets yet?